I am still working my way through the interesting seasonal drinks at high street cafes. 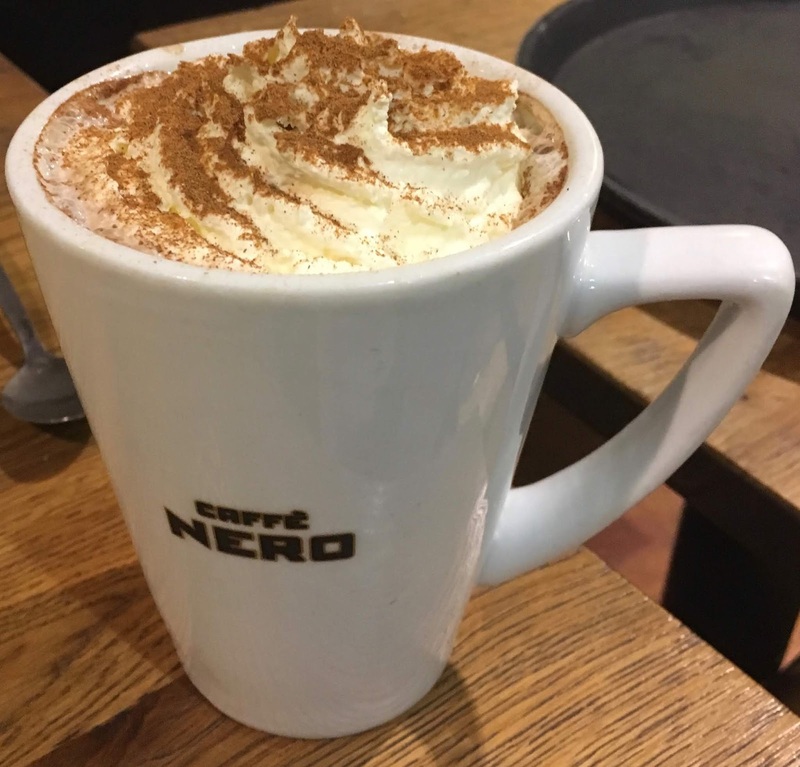 Today I opted not for a Christmas coffee but a Christmas hot chocolate, and I found Ione that sounded appealing in Caffe Nero. Their seasonal drink is called Winter Spice Hot Chocolate, and promises a taste of all my favourite warming flavours. I love cinnamon and the flavours of Christmas. The drink also comes topped with whipped cream and a sprinkle of cinnamon which was where I started, it was also the best part of the drink! The hot chocolate itself is sweet, and yes I know it is a hot chocolate with an additional syrup, but it was overly sweet. I have a sweet tooth too. The chocolate was present, but the main flavour was that of simply sugar. I could pick up on the Winter Spice syrup, there was some cinnamon and some cloves, and the flavour was warming, but it was under the umbrella of an overall sweetness. I like syrups in coffee, but I’m not sure hot chocolate needs anything additional. It might just be that the person who made this was heavy on the syrup and it changed the balance of the flavours, but I’m not sure I’d want to try another. I think I will try a Caffe Nero Christmas latte next, I think coffee is better at holding a sweet syrup.